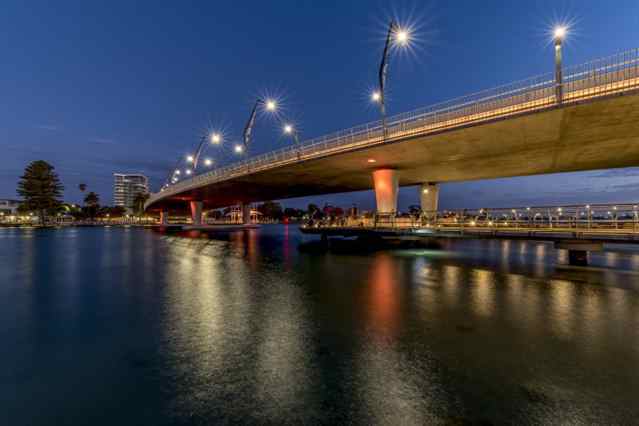 WHAT MANDURAH HAS TO OFFER? The Perth metropolitan area basically consists of a narrow strip running north/south along the West Australian coast bordering the Indian Ocean. 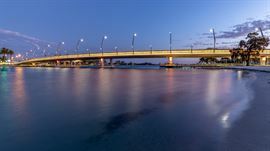 Just beyond its southern boundary lies the City of Mandurah some 72 kilometres from the Perth CBD. It’s a town known for its blue manna crabs and, 50 years ago, people from Perth began driving there to collect them. Over the years the appeal of the crabs, the natural beauty of the region and the pristine quality of the environment, all contrived to seduce the Perth people to the extent that, from a population of less than 2,000 in 1960, Mandurah surpassed the 26,000 mark by 1990. Today Mandurah’s population exceeds 85,000 and it’s still growing rapidly, but these days, the popularity of the region and its growth are due to far more than just the crabs! It's just a short train ride or hours' drive down the Kwinana Freeway. Stretching from the white sands and blue waters of the coast to the rugged terrain of the Darling Scarp, Mandurah and Peel offers a wide range of activities from exploring vast waterways and national parks, to visiting wineries and bush walking along trails through the Jarrah Forests. All with something different to offer, the Peel Region is full of diverse and beautiful spots for weekend getaways and short breaks in Western Australia or if you are like me, it’s a fantastic place to live. In September 2016, Mandurah was recognised as one of Australia’s 50 Best Small Towns. However you don’t have to be wealthy to enjoy the surrounds and it’s not just beaches and ocean. Go inland and rolling pastures flanked by the hills, the state forests and national parks are all on your doorstep. Go south and the pristine beaches abound and, if you want some spectacular wines, you’re less than two and a half hours drive to the famed Margaret River region. Opened in 2007, the railway link from Mandurah to Perth now carries in excess of 21 million passengers a year. The trains are modern, reliable and efficient; the journey is easy, comfortable and pleasant and, from Mandurah to central Perth, takes 50 minutes. Mandurah living is now a lifestyle. It’s no longer merely a ‘holiday’ or a ‘weekend’ destination. 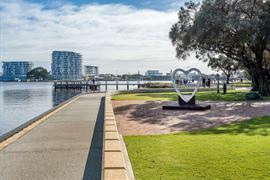 Mandurah and its surrounds have become a place of residence of choice and provide a distinctly different style of living to that of Perth and its suburbs. It’s a beachside atmosphere; smart homes line the coastline, and man-made canals and waterways, reminiscent of the Gold Coast developments, are packed with motor and sailboats on moorings at the bottom of the gardens.